I've just received the graphics that I'm going to encapsulate in the board and it looks awesome! Printed on 135 x 41 cm SILK (although it feels like a synthetic material so maybe SILK is a working name for it. Have asked for some details). StykerMedia (http://www.strykermedia.com.au/) on the Gold Coast in Queensland Australia supply prints like these for surfboard graphics so they've got experience with these being encapsulated in epoxy. $25 per print (cheaper for larger quantities) + delivery makes it about half the prince of dye sublimated PBT and has the advantage that you can actual find a supplier of it!!!! The image is a photoshoped version of The Great Wave off Kanagawa which is one of the series 36 Views of Mount Fuji by Japanese artist Hosukai. I found it on google images (using the 'large' search option) and added the sky because the original is a grey and dull. Close up of the SILK material. looking forward to see the results..
could it be rice paper?? Hi MirsadC. good to hear from you! the material is more like light weight peel. like a very light polyester material. I've asked the supplier as it said Silk on the website but it feels synthetic. I'm going to try rice paper for the logo so i can see if inkjet printer and rice paper works ok. Have you tried paper before? Have you got any board projects on the go? 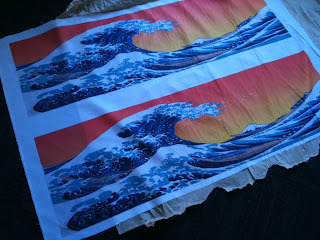 I am really looking forward to c how ricepaper or the silk works for graphics. I have not tried it yet. I think I read somewhere that the ricepaper might bleed when whetted out with epoxy...not sure. My plan is as soon as i get a workshop to start on few projects. Am hoping for a larger scale project. Initially i abandon the idea of vacuuming and investigated a lot how to build a press that can heat up, conform and press at high pressures. Starting on the core at last!!! !